It may seem basic, but I can’t tell you how many entrepreneurs fail to validate their market assumptions. Failed business ideas are a dime a dozen, but it doesn’t have to be. In fact, failed businesses shouldn’t be a thing! Many small business owners go from idea to production without validating their idea, product, or target audience. This is a big red flag because the business does not know if their solution is actually needed in the market! Creative business ideas are great, but remember just because you build it does not mean they will come. These ideas can be developed and executed by using a suite of online marketing tools for small business without having to spend a lot of money or waste a lot of time. Taking time to validate your product and market assumptions will save you a lot of time, money, and energy. There are several ways to validate your product and market assumptions. The easiest, least expensive, and fastest feedback is by using Facebook, Google, and Bing Ads. What’s The Point Of Product Validation? The purpose of using these tools is to create focused ads toward a target audience that you think are your primary audience. These methods need some initial time and money to invest but will cost you about $100 per platform. Knowing this information is vital to implementing a solid content strategy for your business, which can be realized with freelance copywriting services. Plus, you will know how to connect your content to your audience based on their customer journey. Google is great to get a wider reach and drive down keywords. You will need to know how to research keywords, set up ads, etc. So both Google and Bing PPC may take a bit longer and have more variables to have a successful test. Be sure to set your budget max… Google and Bing will shred your credit cards if you are not careful. One thing to note is that on average, this option will yield a larger net, but not always specific on the end user. You will need about $175 to get a good baseline on either Google or Bing. You will also need a good amount of technical know-how to make Bing/Google work for you. Least expensive option, and provides the ability to target an audience on a granular level. Test messaging to a select group first, then expand within your larger audience segment. Set your max lifetime budget, and let the test run for a week. I suggest spending about $100 max per test and let it run for 7 days. Drill down the demographics, etc. for your target audience. Facebook requires the least amount of technical know-how to run a campaign. However, you will want to read up on best practices and keep a close eye on your efforts. If you are not familiar with Google or Bing PPC, I would recommend starting off with Facebook. It is super easy, does not need technical knowledge, and can be set up within a few minutes. Be sure to check your budgets, because Facebook will shred your credit cards in a second if you are not careful. However, this small risk is nothing compared to the insight it will give you about your product and market assumptions. Take your time to test all your product and market assumptions before bringing the product to market. By utilizing Google, Bing, and/or Facebook you are able to learn about your messaging and primary audience for a lot less than trial and error. Now it’s your turn. 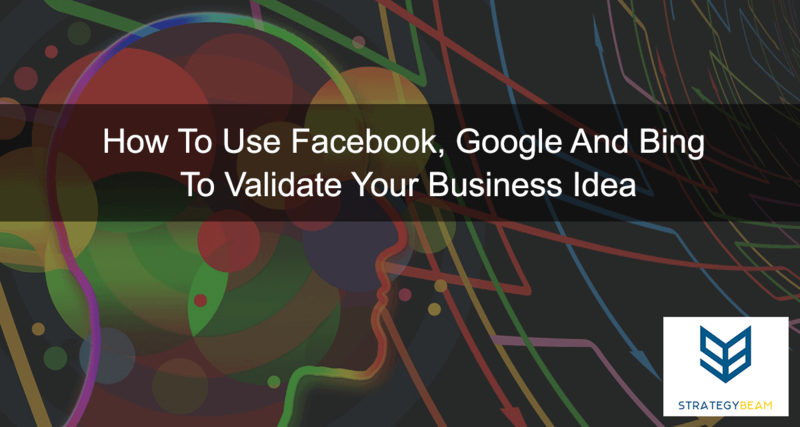 How do you validate your business ideas before investing large amounts of time, money and resources? Let me know in the comments below! Free, No-Obligation Local SEO & GMB Consultation.